Pican Cafe's Brulot has pre-Prohibition Creole roots. He drops a brown-sugar cube into a tall glass, then wets it with Booker's bourbon, which — bottled uncut straight from the barrel — racks up a gut-punching 121-plus proof. Whisking a lighter from his pocket, he ignites the contents of the glass, which he twirls, flames and all, to caramelize the liquor. Then into the glass go Benedictine, more Booker's, freshly whipped Berkeley Farms cream, curling fronds of lemon zest, and locally oakwood-roasted Mr. Espresso espresso. We're at Picán in Oakland, witnessing the fiery birth of a Café Brulot. It's a cocktail with pre-Prohibition Creole roots, traditionally made by brewing cloves, cinnamon, sugar, brandy, coffee, and citrus peel in a saucepan, then pouring the hot mixture into demitasse cups. Picán's panless version goes down warm and smooth, like the world's naughtiest espresso con panna. "What's awesome about the caramelization process is that you get some smoky notes that you wouldn't get if you just used simple syrup," said Picán's bar manager, Sam Babalola. "And the Benedictine, which echoes the coffee's citrusy bitterness, is such an underrated liqueur compared to the Cointreaus and Grand Marniers of this world." Coffee is one heck of a substance. Abyssinian tribes chewed the beans as a pick-me-up. The first known coffee shop, progenitor of all cafes everywhere, opened in Constantinople in 1475. Recent scientific studies link coffee consumption with reduced death rates from stroke, cancer, and even accidents and injuries. Drink up! The best-known coffee cocktail is the Irish Coffee, made since your granddad's day at Brennan's in Berkeley with floatable 50-percent-milkfat manufacturing cream and Farmer Brother's Medium Roast — because that's the kind of coffee most Americans were drinking in the 1950s, when this cocktail was born. But post-Peet's mixologists are expanding the archive all over the place with concoctions such as Gather's brandy/cream/espresso/coffee liqueur Shots in the Dark, and the Vietnamese Coffee Martini at Vanessa's Bistro, comprising vanilla vodka, chocolate liqueur, Ghirardelli chocolate syrup, condensed milk, and slow-dripped, superfine, lustrously dark-roast coffee that chef-owner Vanessa Dang buys in her hometown, Saigon. "Coffee is useful in cocktails and difficult in cocktails for exactly the same reason: its distinctive flavor profile," Babalola explained. "It's all about the bean. Some coffee beans are very, very high on the citrus component. Some aren't so high. The flavor of any coffee is totally dependent on the region where the beans were grown. It's similar to the situation with wine: Grapes grown in Napa will produce very different-tasting wines than grapes grown in Spain or Brazil. "Terroir will have a lot to do with how a certain coffee tastes, and so will the fact that different parts of the world prefer their beans roasted in different ways." Picán's bartenders use espresso rather than regular coffee "because it gives you that advantage of the flavor really, really shining through" in drinks such as the Espresso Cocktail: Served in a stem glass and made with cold espresso, Sobieski vodka, and Godiva white-chocolate liqueur, it's a smooth, strong, not-too-sweet pal for Chef Sophina Uong's palatially buttery, gloriously gooey Georgia pecan tart. "Coffee lends itself especially well to desserts because its bitterness balances their sweetness," Babalola said. "The trick is in finding the right balance to provide the experience you're trying to achieve." 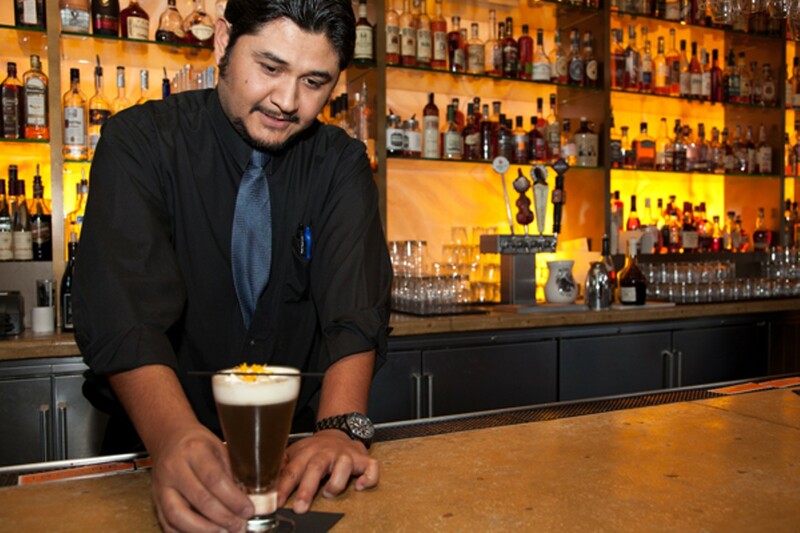 At the Terrace Room in the Lake Merritt Hotel, Chef Devon Boisen favors small-batch, single-origin coffees from Oakland-based Roast Co. Coffee cocktails are essentially "the original Red Bull and Vodka, with twice the jitters," Boisen joked. "They give people both of their fixes at once." 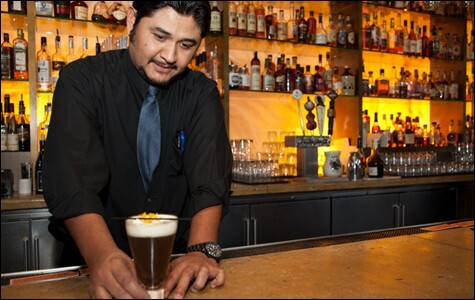 Along with a range of original coffee cocktails, a popular Terrace Room classic is Spanish Coffee: rum, Kahlua, Triple Sec, sugar, cinnamon, nutmeg, coffee, and foamed cream — with a burst of blue flame. If coffee cocktails are about to become the next big thing, Boisen credits this to coffee's not-so-secret weapon: its bitterness. "Everyone's getting into bitter drinks these days," he said. "It's a trend with which I agree — although it took me a while. It was Tony Bourdain, of all people, who served me my first Negroni — and I almost spat it out. I was thinking, 'This thing is awful! Why did you serve it to me?' ... But once you develop those parts of your palate that can appreciate bitter flavors, once you find that balance, it's fantastic. People are drinking all those Negronis for a reason." "Some beans are almost molasses-flavored and quite a few beans come off as almost cherry-esque," Boisen said. "If you wanted a fruity drink, you could mix a cherry-esque coffee with something you wanted cherry in. For example, you could make an interesting Manhattan that way." For infusion fans, he has big plans: infusing coffee beans in booze. "Wouldn't it be fascinating to steep the beans in alcohol? It would pull out their essence without watering the drinks down" as much as a measure of brewed coffee would. "Just use a straight grind in a sachet bag, like you would if you were making stock. In cognac or Grand Marnier, that might be a nice little chilled shot." And if those scientific studies are to be believed, it might even save your life. At eVe's reincarnation, Peruvian street food satisfies.